we were given a mission by Starfleet command to go to Quo'Nos and pick up an important Klingon Ambassador, despite my crews history with Klingons. Lieutenant Debbydo Resident seemed to be the most effected, although Ensign Madison seemed to be holding back much aggression toward our Klingon guest. 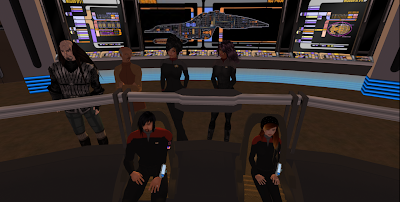 We were also joined by Major Dos of the Bajoran Militia, he claimed that the Bajorans were very interested in the outcome of the peace talks. after picking up Ambassador Kor we headed towards the specified neutral planet, and en route encountered a Cardassian Warship who demanded to search our vessel, after talks that did not go successfully we were forced to disable their engines and continue on our way. when we were nearing the neutral planet we spotted two more Cardassian warships following us, fearful of the Admirals safety on the planet, i ordered we drop to impulse a safe distance away. they claimed that the warship we encounted was missing, so we told them where to find it, luckily, weapons did not need to be fired in this encounter. When we arrived at the planet we were informed that i was being blamed for the destruction of three cardassian warships. hopefully, this log, as well as the others we gave to the Admiral will let the truth be known. the peace talks went roughly but successfully, we now have closer ties with our Klingon friends and the chance of falling into war with them was greatly diminished.